Free Booklist Webinar Coming 10/20! Please join me for a free Booklist webinar, sponsored by Cherry Lake Publishing, on Thursday, October 20, 2016, at 2pm Eastern / 1pm Central. Primary-aged children are natural makers. They couple their imaginations with the physical and digital worlds as they poke, prod, push, pull, pixelate, and produce. Whether using digital tools, circuits, robots, or recyclables, many of the core questions are the same: What is our role as facilitators of maker mindset and purposeful exploration? How do we set up spaces that welcome creative interactions with materials and peers? In celebration of the launch of the Makers as Innovators Junior series for K-2 students, Cherry Lake Publishing invites you to engage with these concepts and build or refine your vision for playful thinking. 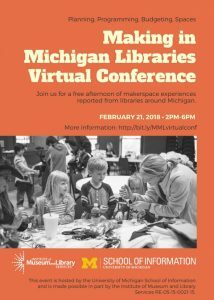 Presented by series editor and University of Michigan School of Information faculty member Kristin Fontichiaro and moderated by Books for Youth editor Dan Kraus. You can register here. If you cannot watch the webinar live, an archive link will be sent to you a few days after the live event.